I must tell you that such a movie shoot is a hard work. The dish, which I am showing to You in this movie is simple and not time consuming. Great as a starter or a small snack when looking for something to munch. 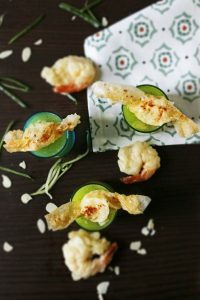 On the top of mozzarella candies I have also prepared some prawns in tempura. Both, the prawns and mozzarella harmonized very well with the delicious gazpacho. Ingredients You need to make gazpacho. How to prepare cucumber gazpacho. What You need to know when making gazpacho with mozzarella. Phyllo pastry must very carefully and tightly cover the mozzarella otherwise it comes out of the candy during frying.